Kellogg has a long history of helping to launch women into the C-suite. From the first female CEOs of some of the world’s largest corporations to the first female selected to lead a top 10 global business school, Kellogg graduates have broken the glass ceiling time and again. As pioneers in women’s leadership development, we care deeply about seeing more progress. We believe that getting more women to the highest levels of business is important for our organizations, economy and country. Further, we want to see more women achieving their highest potential by experiencing the impact and meaning that can come with a sustained career trajectory. The challenges professional women face are different from those faced by professional men. Our belief is that if we can find new and better ways to help women navigate the three critical career Pivot Points where these differences come to the fore (Launch, Mid-Career and Executive), we can increase the number of women filling the pipeline to the C-suite. 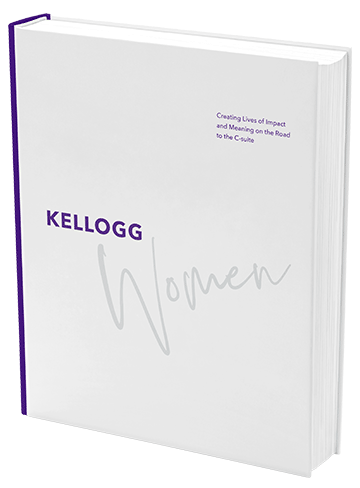 To write Kellogg Women, we reached out to thousands of Kellogg alumnae via surveys and interviews as well as other leading organizations conducting research into female leadership. The goal was to uncover unique insights into what key development goals a woman needs to be seeking at each key Pivot Point in order to establish and sustain a trajectory that could see her rising to the C-suite. Our hope is that if we can get 25 percent more women to apply to business school; if we can get 25 percent more women to take business jobs early on; if we can get 25 percent more women to stay in the full-time work force during the mid-career marathon years; if we can surround our strongest senior women with the support they need to reach for the biggest jobs, we could finally begin to realize our full potential as a society that espouses equal rights for all. To buy Kellogg Women please click here.